There are a lot of steps in implementing a backend for your iOS app with Google App Engine and adding Firebase authentication to it, with some tricky bits during the setting up of the tools. Hopefully, this quickstart guide will help you to smoothly implement your backend, without missing any of the tricky steps (and spending hours, or maybe days on debugging). You need to have Git and Python 2.7 installed on your system. Additionally, if you want to integrate the backend in an iOS app, you'll need Xcode 7.0 (or later) and CocoaPods 1.0.0 (or later). Go to Google Developers console and click 'Create Project'. Install gcloud tool for your platform. This tutorial was initially written to use Google Cloud SDK 138.0.0 running on a MacOS OS X El Capitan machine but has been tested to work on Google Cloud SDK 175.0.0 and MacOS Sierra. Import the Google Cloud Platform project from step 2 in the firebase console by clicking on 'IMPORT GOOGLE PROJECT' and selecting the above project. Make a note of the firebase project id. Enable Email/Password authentication for the project in firebase console by clicking Auth > Sign-in method. Under Sign-in providers, hover the cursor over a provider and click the pencil icon to edit the sign-in method. Step 2 - Get the backed code. 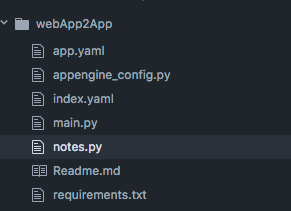 An app.yaml file - This configures the App Engine application's settings e.g. how URL paths correspond to request handlers and static files. An index.yaml file - This tunes the indexes for the properties of entities used in your application. Don't worry if you don't yet understand what this means. A main.py file - This defines the route handlers for the api. A notes.py file - This defines the handlers for the api corresponding to the notes endpoint. An appengine_config.py - This file has a method which registers the libraries directory for the app. Please note that if you need to include your app backed in unit tests, you will need to additionally import this file in your test script file. Step 3 - Install the requirements for the backend. Step 3 - Understand and configure the backend code. An app.yaml file specifies the services that run on the server and the scripts where the corresponding request handlers are defined. Edit the app.yaml file and replace the PROJECT_ID with your firebase project id from step 1.4. Note, the 'service' property in the app.yaml is currently specified as 'main'. Since, our app only has one service, this is also the default service. You can now run your backend locally by running the following command from the webApp2App directory. If you will be running your iOS app on a iOS device instead of a local simulator, you will need to start the development server with the following command, with replaced by your computer's IP address. You can check your local Google App Engine instances by visiting http://localhost:8000/instances on your web browser. You can deploy the backend (the backend will run on Google servers) by running the following from the backend directory. Step 6 - Add Firebase to the iOS app. You'll need to make a note of the iOS app's bundle ID before continuing. This can be found by clicking the project name in Xcode and reading the Bundle Identifier property from the General Tab. Open your Firebase project in the firebase console and add firebase to your iOS app by clicking 'Add app', selecting 'iOS' and then following the setup steps. When prompted, enter your app's bundle ID. It's important to correctly enter the bundle ID that your app is using. Download the GoogleService-Info.plist file and copy this into your Xcode project root. If you are using the example project, replace the existing GoogleService-Info.plist file with the one you have just downloaded. Step 7 - Add Firebase to the iOS app. Create a Podfile for your project if you don't have one by running pod init from your project directory. The Podfile is already present in the example project and you can skip this step if using the example project. Add the following pods 'Firebase/Core' and 'Firebase/Auth' to your Podfile. These are already present in the example project and you can skip this step if using the example project. Install the above pods by running pod install. From now close the FrontEndTest.xcodeproj (or your-project.xcodeproj if you are using your own Xcode project) and you should use FrontEndTest.xcworkspace (or your-project.xcworkspace). 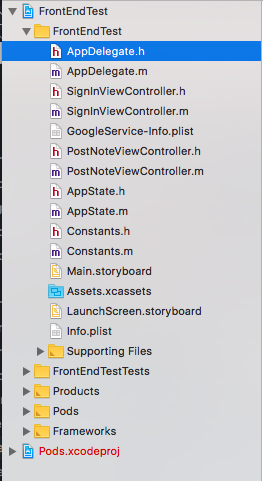 You will notice that the example project imports the Firebase module in the UIApplicationDelegate subclass AppDelegate: @import Firebase and configures a FIRApp shared instance [FIRApp configure] in the app's application:didFinishLaunchingWithOptions: method. The sample app FrontEndTest is a very simple app with just two ViewControllers - SignInViewController and PostNoteViewController. The SignInViewController allows the users to register/sign in using their email-id and password while the PostNoteViewController allows the user to post and get their saved notes. When a user registers/signs in to the iOS app, they send their username and password to the firebase server. The server checks the credentials and returns a token if they are valid. The example project retrieves the token in our iOS app in the following manner. Step 9 - Configure iOS app requests to the Google App Engine Server. Configure your requests to use the Google App Server's base url or your localhost url (http://localhost:8080 if running your app on the simulator or http://YOUR-IP-ADDRESS:8080 if running your app on a device). If you are using the example project, you'll need to change the hostname property inside the viewDidAppear method of the PostNoteViewController. If you create your own requests, remember to change the URL to your own base url. Create methods to create HTTP requests to your API. If you are referring to the sample app, these have already been created for you. For. e.g. the method formAfGetRequestWithToken create an HTTP GET request to the http://_hostname/notes endpoint with the firebase token added to the Authorization header of the request. Look through the sample app's code for examples of how to handle the HTTP response from your backend. Please note that there are a variety of libraries available that'll allow you to make requests and parse received json objects much more efficiently. You can now build your project and run your iOS app on any iOS device or simulator and should have a working app with a connected backend. Congratulations! You now deployed a functioning backend for the example iOS project. You should now be able to use the iOS app to create and retrieve notes for users.